I was quite excited when the mailman delivered a package to me yesterday containing a brand new book. The title, Memoirs of an Elusive Moth by Adele Friel Rhindress. I've mentioned Adele before in my blogs, but in case you don't know she worked with Harry Blackstone Sr. for several seasons. This book is about her adventures from that time period. First thing I want to say, is it ok to give a book a standing ovation? I loved this book!!! For one, though it is about the Blackstone show, you really get the see the show through Adele's eyes. She has a number of her own adventures that she shares as well. I got a kick out of the 20 hour sleeping story. Actually, I enjoyed all the stories! I also had the honor of hearing a number of these stories in person last summer when I was in Pigeon Forge and Adele and I went to lunch one day. She describes in the book, a letter that Harry Blackstone Sr. sent her about the new season and how he wanted her to come back to play the part of 'The Elusive Moth', a new routine they were creating specifically for Adele. I actually got to see the letter during our lunch last year. Also, Adele was a featured speaker during my 'Magic Detective' Session at KIDabra and she shared a couple stories about Harry Blackstone JR. that also appear in the book. But there are many things I had not heard before and she captures them so well. She talks about Del Ray and Nick Ruggerio as well as a number of her fellow female assistants in the show. Adele also shares stories about the non performing cast members and helps the reader to see how important each and every person is/was in the production of the stage spectacular known as Blackstone And His Show of 1001 Wonders! Besides giving the reader a sense of what it was like traveling with the Blackstone show, she also gives a glimpse into her own life as well, which I was really happy to read. The book is about HER and her experiences and I'm so glad that she included some none magic history in there as well. If you love history, get this book. If you know Adele, you must get this book. 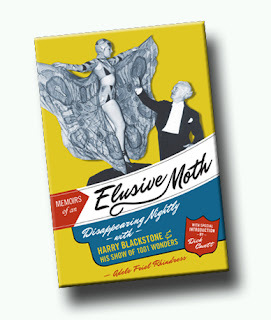 But if you just want to just read a book that will make you smile, then without a doubt get a copy of this wonderful book, The Memoirs of an Elusive Moth!